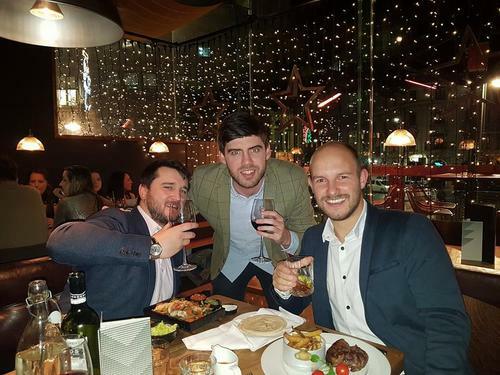 On Friday, we went to Leeds city centre for our Christmas night out. This is the first time this year that we've allowed ourselves to let our hair down (not literally in my case! Ha!) and really reward ourselves for the work we've put in during 2017. In the afternoon, we checked into our 5* hotel and relaxed in the spa and then headed over to Grill on The Square for a top meal and drinks. As a big fan of a top quality steak, the 10oz Fillet was an absolute dream! After that it was on to a number of bars late into the night. Dont ask me what happened, what happens on tour, stays on tour! 2017 has been a brilliant year for Amicus Recruitment and we'd like to thank all of our clients and candidates who have helped us get to where we are today. We're so excited about the future and hope that 2018 can be even better! Our promise moving forward is to reward our people for their dedication and commitment to helping us grow. We'll be having monthly director meals, quarterly trips away and a world class trip away once a year for our elite performers. At the start of 2018 we're going to be looking to hire at least three aspiring recruiters to join us on our journey. Is that person you? Please get in touch and be part of something great!